Dr. LaSharnda Beckwith, PhD, MBAA, MA, BPS, is an Empowerment Advocate, personal life coach, motivational speaker & leadership expert. She knows that in order for anyone to experience success in their personal or professional lives, there must be a fundamental change in attitude. One cannot be or think negatively and expect positive results. In addition, she loves to interact where she can encourage, enable, empower and energize others. She is a retired executive of more than 26 years with the Army & Air Force Exchange Service. 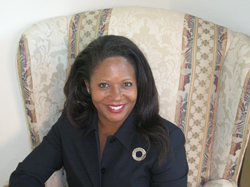 Dr. Beckwith is the President and Chief Executive Officer for Beckwith Leadership Group, a personal and professional development organization. She is also the CEO for her non-profit organization, Professional Christian Women in Service, an organization that supports the needs of women by enabling, encouraging, energizing and empowering women. She is an author and talk show host. Most importantly, she has been married to Daryl Beckwith for 32years. They have one son, Brandon, who is a dynamic personality with a great smile, warm heart, and entrepreneurial spirit. She has one grandson, Jaden, who is the joy of her life.